← Back to Basics: The Weekly Savings Jar Idea. Thats bad, the school should do domestic science. That would included planning a menu, shopping list and budget, and actual meals 3 times a day preferably. A complete nutrition guide should be followed in order to meet all he requirements. Visiting nutritionists (hopefully voluntary sessions) could come and ensure all diets i.e. Gluten free, diabetic, any allergy/sensitivities and vegan, vegetarian etc. Are all catered for within budget. And school should be working on earth science, environment and agrarian projects and growing foods in greenhouses and allotment style to ensure all are fully capable of meeting their needs in small budgets. I am a gardener at a community center that has a food pantry for the poor. I am asked to talk once a month about gardening while people are waiting for the monthly government food distribution, and there are other volunteers that do a cooking demonstration while people wait in a hall until their number is called. Perhaps you could do something like that? It works well for us. But its tricky when people are so poor. They don’t like being told how they should do things, or feeling like they made their poverty happen because they weren’t thrifty enough. Often they have come up with some good solutions for using inexpensive food, but they now feel their back is up against a wall and there is a limit to what they can do. When the volunteer cooking instructors instead talk like a gourmet chef rather than like a budgeter…somehow it goes over better, and I find if I listen to their tips about gardening or their recipes for vegetables, they are more willing to listen to mine. Hmm I am honestly not sure how much we spend! That could be something to work out over the next week or so. I really love the simplicity of this. I know I probably spend triple that amount and we eat terribly unhealthy! This is something I desperately want to change. Will you please keep us posted on your progress. I adore this idea and your blog!! Happy New Year from Wyoming! We currently budget $50 a week and often stay quite close if we’re not entertaining. I’m following your lead and trying out your recipes I’m January. As Canada is frozen right now, the rationing will help us not devolve to processed comfort foods. I’m curious to see how my grocery budget is impacted at the end of the month. This week I added a few non-ration friendly treats and spent $30. Thanks! the $50 feeds 2 adults plus Bunny vegetables. I suspect we’re going to start making her share her veggies as tvose aren’t rationed. Make a large pot full and put it in a vacuum flask! This is why my Grandma had weak tea with no sugar. She was 21 when the war broke out. My parents also made us children eat whatever was put on the plate, even if we hated it, because their formative years was during rationing. My Dad was born in 1942 and my Mum in 1944. It would have been her birthday today (31 Dec). Happy new year everyone. I use my glass milk jug I keep and did not turn back in for discount because the store I got it from closed . It is a 64 oz. or 2qt jug 2-3 tea bags, hot water let steep or make sun tea and I have tea cold or reheat for 2-4 days . depends if I drink water also that day. tea last longer. hot water to drink hot I know OMG no! But it works in a pinch for me. First, I’m an American, born and bred. Second I was “born” in the North – Midwest actually, but still considered north, when compared to the South -where I was “bred.” Tea in America is an unusual animal when compared to Great Britain. Its not just “tea” as in black tea, or whatever breed is preferred in the UK. It can be hot tea, iced tea, plain tea, sweet tea, either hot or iced, green tea from the Orient, or herbal tea of any of a dozen or more blends, depending on where you are, who you are, what you were raised on or just your personal preference from a lifetime of exposure. Down south in the USA, iced sweet tea, sometimes so sweet that it’s known as “a little tea with your sugar” is also known as the “House Wine of the South.” On this I was raised. Not a constant stream of it, mind you, but during the long, hot, steamy summers, from May to the end of September, when you’re thirsty for something icy cold and refreshing, next to a Coca Cola, iced sweet tea is the deal. In every restaurant south of the Mason-Dixon line, if you order iced tea, it just naturally comes sweet. To get it plain, you have to specify. And then you’ll get your plain tea, an offer of no calorie sweetener just in case you’re dieting or diabetic, and a sorrowfull look from the server. And, every self-respecting Southern woman (from the age of about 14) knows how to make a very respectable pitcher of iced sweet tea. One of my aunt’s down there used to make it so sweet even I had to water it down, when I was a child! But everyone has their preference. And we all have our favorite brand of tea bags, and type of sugar, either cane sugar or beet sugar. Its something about the way the crystals of the sugar dissolve, or sweetening power, or more likely just personal preference based on how Grandma passed on her personal recipe and nobody really knows why, but those things seem to really make a difference. I happen to have my own personal preferences too, but my method seems to produce the best tea I’ve ever put on ice! We live now in the country, (And in the North, but there seems to be hope even for them!) with well water that has a good bit of iron in it, and it doesn’t make very good tea. We have a water softener that takes out most of it that goes into the water heater, and most of the cold water as well. But it still doesn’t make good tea. So, I use commercially bagged ice made from filtered water, and pure distilled bottled water in gallon jugs.. Luzianne brand tea makes a blend just for iced tea, and Domino brand cane sugar. I bring half a gallon of distilled water to a rolling boil, and turn it off. There’s a cup and a half of sugar in a four cup measure. Enough of that hot water is ladled into the sugar to almost fill the sugar cup. Then I drop four triple size teabags tied together by the strings, in the hot water, and let them steep for 9 minutes. Not 10. Timed by the clock, 9 minutes. The hot water and sugar are stirred gently until completely dissolved and clear like a syrup. At 9 minutes, the tea bags come out, into a large strainer, and pressed gently with a big spoon, then discarded. The sugar water is stirred into the tea, then poured quickly over ice that fills a one gallon pitcher about 2/3 full, stirring briskly until as much of the ice as possible is melted. I keep the tea in the fridge covered with the lid that comes with the pitcher. If i make two gallons, i pour the tea for the first gallon back into the empty water jug from the pitcher. Then the second batch of tea is processed in the pitcher, and stored. And pour over additional ice to serve in tall glasses. So, leave out the sugar if you must, but my sweet tea has converted my Northern born husband, and several friends of his! The plain variety won over his sisters, and even wowed his father. It’s just dark, clear and smooth as velvet. Hot or cold. And it really makes more than a gallon of tea, because it’s poured over additional ice when served, which gets melted into it, adding to the volume. So, drink it cold over ice, or hot in a cup or mug, slightly thinned with a little more water. Add lemon, milk, whatever is your pleasure, or drink it straight. That’s enough water for 2 gallons of tea, and those large iced tea bags each equal three regular size bags, so that’s 12 to the gallon. Enjoy! There were no tea bags then. The teapot would be warmed before the tea was put in. One level teaspoonful of tea for each person present and then one more added for the pot! Boiling hot water was again added to the same tea leaves in order to get a second brew. I remember rationing very well. The family had to register with one grocer and stay with that person for the year. I also remember when sweets came off ration. There was such a demand that they were rationed again. Everyone with a garden would grow vegetables. I remember that every day was porridge or bread soaked in hot milk with a sprinkling of sugar or jam. I believe it was called sops or something similar. The treat was an egg on Sundays but this was forgone if the previous eggs were saved for a cake. Bread or toast with dripping was a huge favourite and everyone had a dripping bowl which contained left over fat that was reused. If you were lucky there was beef gravy at the bottom of the bowl that tasted wonderful on toast. I am following this site with such pleasure and wish everyone success this year. I cannot emphasize enough how important it is to have at least a weeks emergency supplies of food and toiletries. This alone can help in so many ways. I spend around £200 a week on food and drink! There is only the two of us. I think some of the prices are a bit out, milk for example is 79p for 2 pints in Aldi at the moment, but a full tin of corned beef is only £1.59 ( if memory serves me right), so it probably evens itself out. However, you would need to include herbs, spices, sauces and flavours and these can be surprisingly pricey. For those who suggest putting tea into a flask of reheating days old tea, you really don’t like tea do you? I am so fussy about my tea it’s unbelievable, and would sooner cut down on the quantity of tea I drink rather than the quality. 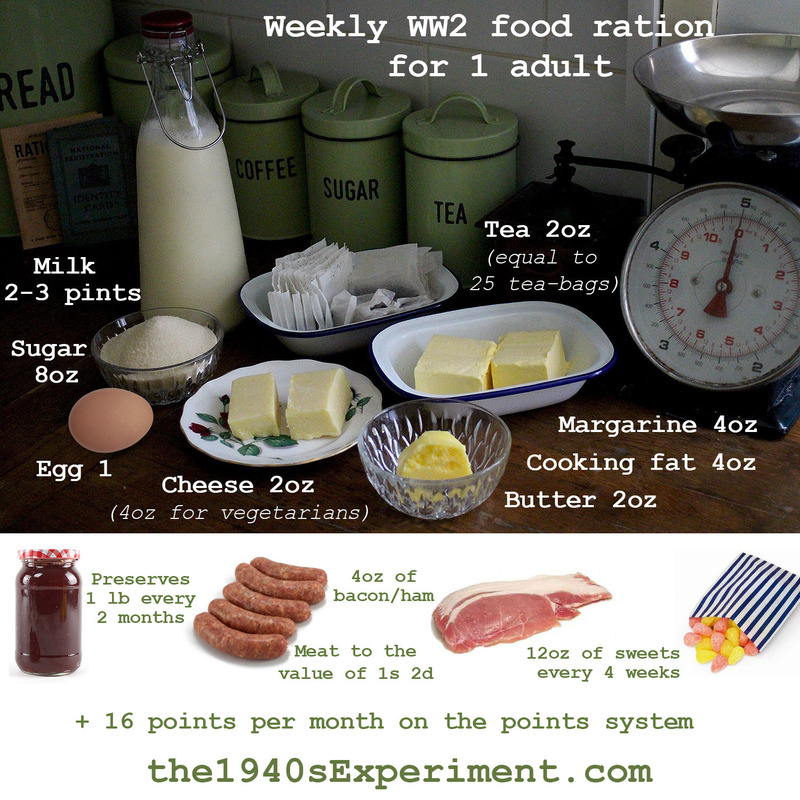 Incidentally, am I the only person who puts ON weight when living off WW2 rations? Which is a shame because I do enjoy the discipline of it, of course, it’s not enforced, so that helps me appreciate it so much more. Hmm not to reheat the tea (oh and love tea by the way!) but more to ensure you cut down the tea bags/loose tea you are using on a daily basis by having two or three mug fulls in a flask ready! It’s got to be freshly brewed for me! Having small pots with herbs growing is a huge way to save on costs, especially the basics of mint, basil, thyme and rosemary as they just keep on growing…..and can be done on a windowsill. I have switched to leaf tea exclusively as it has a much richer flavour and is far better environmentally. Not all that excessive packaging, and the tealeaves go onto my veg garden. It really helps if you have a teashop (as in tea merchant not café,) you can buy from such as the one nearby me. And for my lunch I have a good collection of little containers to use for everything which pack into each other and will last for years and years. I bit the bullet and bought slightly more expensive ones made from reclaimed plastic, and they go into the recycle when they are broken or worn out. and on checking, I seem to have used about 8oz sugar since I moved to this house over 4 years ago. I have no sweet tooth! Happy New Year and every good wish to you! The sugar was to make jam to preserve fruits at a time they weren’t available which also explains the jam. Carolyn, I LOVE your blog! I have followed for years, but this is the first time I have commented, and I just want to thank you for providing something that is interesting, educational, and really useful for these days of tight budgets. I also follow a vegan diet, and I love adapting your recipes to be vegan; for me, economy, taste, and living meat-and-dairy-free all come together in your site. I especially like this post, because this month my food budget is about $60, and I find that there is a real joy in being creative, and using the inspiration provided by The 1940s Experiment. Happy 2018, and again, thank you!!! Don’t let govt. know this figure. This works for people who can plan, cook from raw ingredients, can follow recipes and who have a proper kitchen. Not much help to the e.g. Grenfell Tower survivors living in temporary accomodation. ‘Domestic Science’ WAS taught in British schools (but only for girls!!) in the past. However, it did not have much impact on the children who needed it most. For example the girl who had a Curly Whirly chocolate bar and a packet of crisps for lunch and bread and jam for supper. When she took fish pie, cooked at school, home her parents said: Yuk! and put it in the bin. Nowadays ‘Useful’ knowledge is banned from schools, which are ranked on GCSE results and not on what the pupils have gained from the time at school. And the poorest and most deprived families depend on ready cooked takeaways or frozen stuff to put in microwave And have done so for decades. I don’t know what the answer is. Eating a healthy and economical diet is a ‘luxury’ to be enjoyed by the priviliged section of society. Sorry to sound negative- I had sprout and carrot bake with pasta for New Year dinner.- Yum! HAPPY NEW YEAR TO YOU CAROLYN and to fellow followers of this Blog. Sounds like the current situation. Cut funding for everything that has any connection to arts, music, domestic or vocational skills, programs for challenged students, those who require one-on-one attention daily with an educational aide, and a specific plan of action for their education, and anything else that isn’t the subject of standardized testing. Which is what is taught in lock-step fashion, teach to the test. Nobody gets to develop actual critical thinking skills anymore, or analysis, or research as the latest Presidential will attest to. “Dumbing down the educational levels seems to be what they fall back to, instead of finding actual ways, effective ways, to help teach the skills to those who have troubles keeping up, and actually learning what’s needed to function in today’s world. Oh! And lord help you if you happen to suggest that dollars be subverted from ATHLETICS and into the classrooms! They will have you ridden out of town on a rail in a heartbeat! Heaven knows too many School Boards worship at the Altar of Athletics. Just take a look at the size of the athletic fields of the majority of suburban high schools, and compare to the size and equipment inside those schools. So, thank you very much for your patience with me, and hopefully, I won’t have to do any more of this! We spend about $150 (US) a month for groceries for three of us. I do buy meat in bulk much of the time so every few months I spend an extra $100 or so for that. I invest in really good deals so I have to estimate because I also buy in bulk (for example, a couple years ago I got 25 pound bags of pulses for 50 cents a pound). https://polldaddy.com/js/rating/rating.jsI’m sure I spend way more. This year I’m trying to dig my way out of thyroid and stress induced weight gain so I’m hoping to glean lots of inspiration from your recipes. Some months, we spend more than $52/month per person and some months we spend less. I tend to save a great deal from growing my own veggies and canning/freezing things. I buy things on sale. But, I’m sure during WWII it would not even be possible to buy things on sale, or get the wide variety we like to eat. I like to think I would have been one who grew veggies in my victory garden and helped my family eat better. I’m starting in earnest now. I currently weigh in at 22 stone (i think thats 308lbs) way too much anyway. It’s going to take an act of will, as most diets do, but i’ve been trying this system out for a couple of days and to my surprise i’m not forever hungry or without energy, why have I not seen this before? Well here we go. Thank you for this, Carolyn! I love your blog, as you may already know, yet I find the beginning of the year to be an inspired time for both food consciousness and frugality. Your blog is a go-to for me for both. Thank you for your continued efforts to inspire and share your story. Hi Carolyn, good luck with the budget et al ….. I am a bit concerned about the list of items on WWII budget, butter, cheese, sugar, margarine, bacon, …. this sounds like a disaster for dieting to me. We do need a certain amount of fats etc but how do you manage on this diet? Your current photos show a lot of greens, good things … I hope you can continue to do that! Tea bags have plastic and other nasties in them, the stuff that leaves a scum in the mug, and a nasty after taste. I use proper loose leaf tea, and make a teapot full and top it up with boiling water for a second or third mug. If I have only time for one cup, I strain the rest of the pot into a clean jug, and re-heat it later, but not to boiling point, and then add a little milk. It tastes just fine. Waste not, want not. The wartime rule was one teaspoon of tea per person, and none for the pot.